Have you ever had red spots on your skin after a long hike that you just can’t stop itching? If so, you have probably been bitten by a tick. Ticks exist all around the world and they could be living in your backyard, or even in your house. These blood sucking insects will cut your skin to extract your blood. Ticks are arthropods (insects with external skeletons but with joint legs) but are not spiders; instead, they belong to a special group of mites. 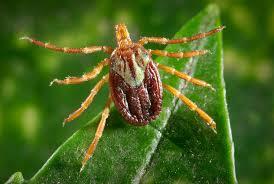 Ticks live on all seven continents, but mainly thrive in warm, moist areas. Ticks prey on a variety of animals, including mammals, reptiles, amphibians, and birds. In order for a tick to live in a certain location, it has to have a high enough population density of host species, and it needs to be humid enough for the tick to stay hydrated. If you ever find a tick on your skin, remember to never use your fingers to remove it. Instead, use sharp tweezers, because they will allow you to get a good grasp on the tick. In order to remove the tick, first clean the area around the tick with rubbing alcohol or just soap and water. Press the tweezers right down on your skin to get as close to the tick’s head as possible. When you have pinched the tick between the tweezers, gently pull it off, but make sure to not twist or jerk it off. Finally, wipe the area and your hands off with soap or alcohol. After you have extracted the tick, you may consider sending it for testing. Sending a tick for testing is a good way to find out if the tick was carrying any diseases. When sending it off for testing, put the tick in a sealable container with a blade of grass so it will survive. Lyme disease is the most common disease that ticks transmit. Over 300,000 people are diagnosed with Lyme disease each year. Symptoms of Lyme disease include, fever, chills, fatigue, muscle and joint pain, and headaches. Though Lyme disease is very dangerous, it can be cured with antibiotics in about 2-4 weeks. Scientists have tested that Lyme disease can only be transmitted if the tick has been attached to your skin for 36-48 hours. Ticks are present in almost every type of environment, so preventing any of them from biting is always important. Some general tips for protections are to apply chemical repellents such as DEET or picaridin on the skin, tucking in clothes so that ticks cannot reach the skin, and checking yourself and pets for ticks daily. Ticks are everywhere, so stay safe!